This is another phone post. After 4 hours in ninety degree heat the children wanted to go to the pool. The Chicago series has been strange as it seems that the pitcher who had the better stuff lost all three games. This time it benefited the Tigers. Brad Penny allowed 3 runs, 4 hits, a walk and had three fly ball outs in the second. It looked like it would be a short outing. Somehow he lasted 6 2/3 despite striking out just 2. Humber on the other hand struck out 8. He left in the sixth. 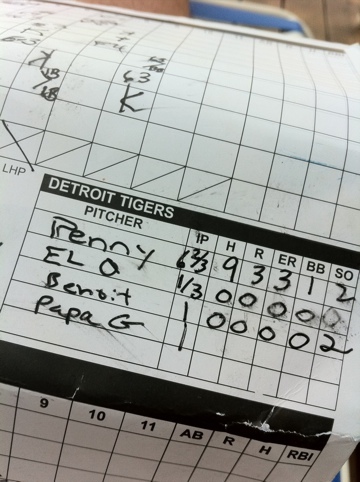 He had allowed a home run to Boesch early in the game. He had allowed two runs in the sixth on a double, a walk and a couple singles. Sale came on and allowed an inherited runner to score to hand Humber the loss. Alburquerque got the last out of the seventh. Benoit pitched a 1-2-3 eighth with two strike outs. Pierczynski had a good at bat (painful to write that) and a walk in the ninth, but Valverde stranded him. The best Radio Disney prize today was a towel from Cars II that one of my daughter’s friends won. Wednesday is my next game. The Tigers have not announced a starter yet. I hope for Verlander, but it seems Furbush is most likely. Maybe there will be a trade. 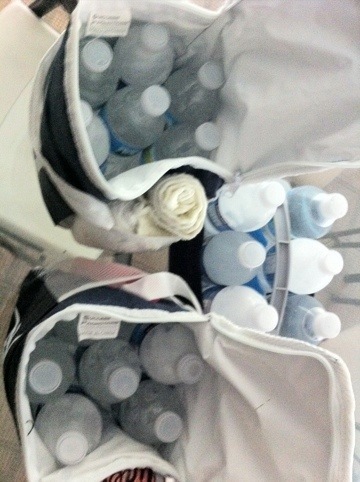 The four of us drank 14 of the 18 waters we brought!